Homemade Ranch Dressing Mix without artificial ingredients and much less sodium! 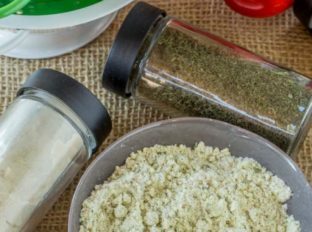 Easy to make and saves money over Hidden Valley Ranch seasoning packets! Homemade Ranch Dressing Mix has become a staple in our kitchen since we discovered all things Chicken Bacon Ranch! Yes, chicken bacon ranch was a brilliant idea Subway had a while before anyone else, but it is by far our second favorite flavor combination in our house. If you’re not new here you know the favorite is of course all things Philly Cheesesteak. This recipe is meant to taste just like your favorite Hidden Valley Ranch seasoning and dressing mix. 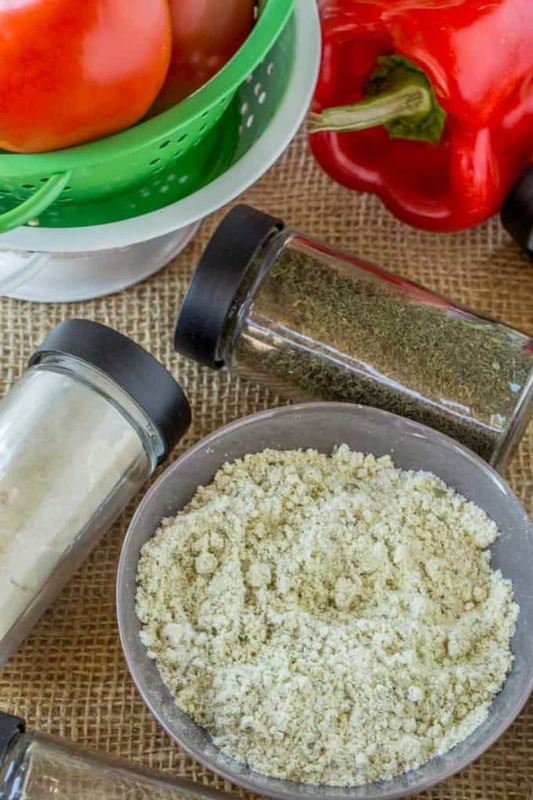 Why make your own Homemade Ranch Dressing Mix? It is infinitely healthier for you since you are using whole ingredients. There are no added preservatives and artificial ingredients and you can make the mix just one time to keep for use throughout the next few months. 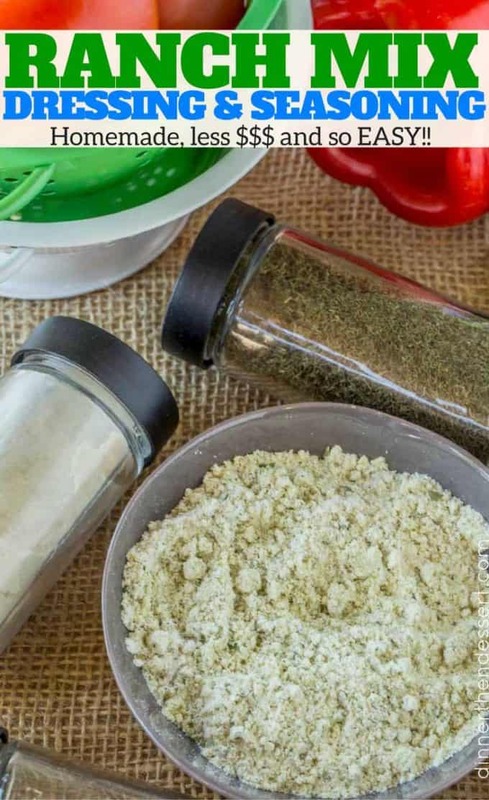 We buy spices in bulk so mixing up these seasoning mixes is a breeze. How do I make homemade ranch dressing from the packet? In a bowl, add 1 cup milk and 1 cup mayonnaise with 3 tablespoons of Homemade Ranch Dressing Mix and whisk until well combined. Refrigerate for an hour before using. What seasonings are in ranch dressing? 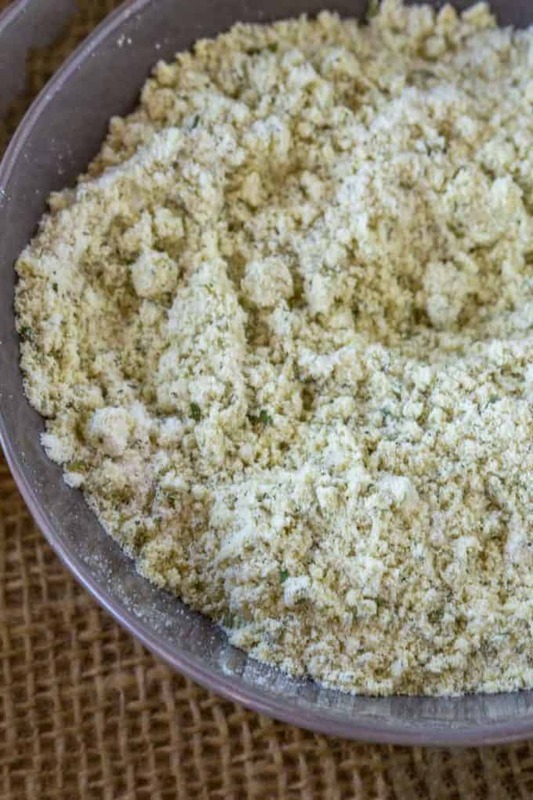 Homemade Ranch Dressing Mix has buttermilk powder, parley, dill weed, chives, garlic powder, onion powder, salt and pepper. Homemade Ranch Dip: by adding 1 cup sour cream to 3 tablespoons of the mix. Ranch Pork Chops: Coat the pork chops in ranch dressing mix and pan fry or roast at 400 degrees (time depends on thickness). Ranch Chicken: Marinate chicken with 3 tablespoons of the mix and one tablespoon canola oil and cook as desired. Ranch Potato Wedges: Toss potato wedges with 3 tablespoons of mix, 1 teaspoon kosher salt and 1/2 teaspoon black pepper and cook at 400 degrees until crispy. 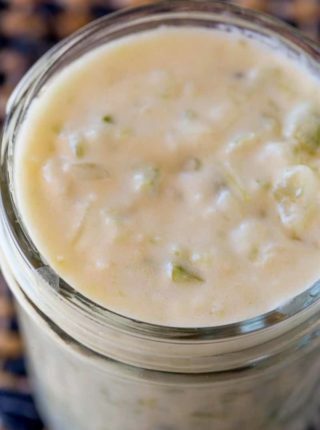 Looking for recipes to use this Homemade Ranch Dressing Mix with? 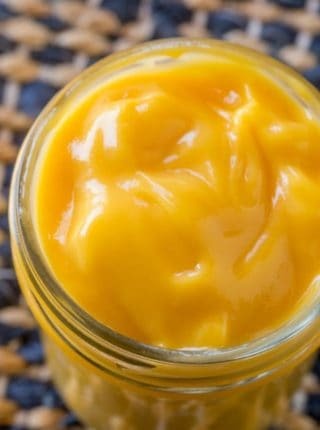 Please note that you are going to have to refrigerate your dressing mix and the buttermilk powder, but it is an AWESOME ingredient to have and will save you a LOT of money. No more buying quarts of buttermilk only to use a small amount and let the rest go bad. Pulse all the ingredients together in a small food processor, then store in a glass jar in the refrigerator. You can substitute buttermilk powder for milk powder but it will change the flavor. Sorry I don’t have a better substitute. Using fresh buttermilk won’t create a dry mix so there’s not really any other option. You can use powdered milk but the flavor will be different. Hi I in the U.K. and we can’t get dried buttermilk here . Can you please tell me how i can make the ranch dressing using fresh butter milk ? Here’s a great recipe for it! We can’t buy buttermilk powder here. We can, however buy fresh buttermilk. 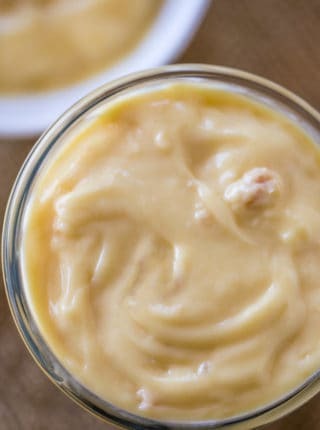 As the dry Ranch mix is also unavailable do you have any suggestions for how I could make this using fresh buttermilk? You can substitute buttermilk powder for milk powder but it will change the flavor. Sorry I don’t have a better substitute. Using fresh buttermilk won’t create a dry mix. Thanks so much for sharing your base and mix recipes, I really appreciate it. I noticed that the instructions for the Ranch Dressing mix did not include information on how much of the Ranch Dressing Mix is needed to prepare a pint of salad dressing or dip. I generally use the mix packets for cooking main course dishes but at times will find them useful to flavor side dishes. My personal preference for Salad Dressings are primarily oil & vinegar based, but I do have a few family members who enjoy Ranch Dressing so I always try to have some freshly made up when they will be visiting. 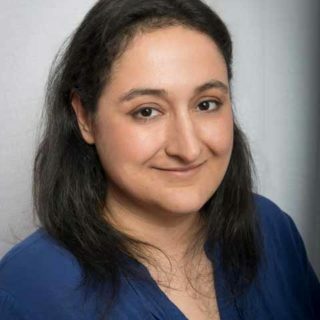 I also read on your blog where you asked readers to let you know if they had mixes or base recipes that they would like to see you post on your site. I was wondering if you might have created alternatives or copycat recipes for Lipton Onion Soup Mix, Knorr Leek Recipe Mix & Knorr Spring Vegetable Recipe Mix. I know a lot of people use them for making dips, but I use them at least twice a month each for making main course meals, so would really appreciate if you had or could help me create alternatives that are healthier and hopefully less expensive. Thanks so much for your willingness to share your training, knowledge and experience with others, it is appreciated and very helpful! Hope that helps! So glad you’re enjoying the recipes! I use ranch dressing mix all the time! Love the idea of homemade! Homemade is just so much better! I looooove homemade ranch! I can’t wait to try your mix! I need to make this asap! I LOVE IT! I’m so happy to have this recipe! I love those packets, but who knows what’s in them, ya know?! This definitely takes the guess work out of the ingredients! Love making my own dressing! I will be saving this! Definitely a great one to have on hand! 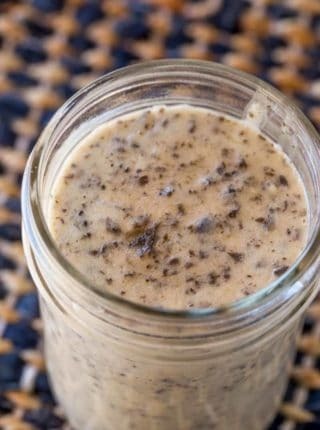 I love making my own dressings and you can use this for so many things! Thanks for the inspiration!